Port-au-Prince:- In the past several weeks, UNITED SIKHS has provided emergency shelter to over 5,000 earthquake displaced Haitians. The Urban Design and Development Team headed by Jaipal Singh, UNITED SIKHS Coordinator, setup five new tent cities pitching over 680 tents provided by UNITED SIKHS Toronto. 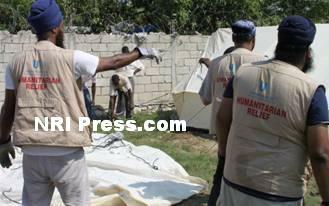 Working with the UN Shelter Cluster, local community organizers and religious leaders, our Haiti ground team targeted those communities on the outskirts of Port-au-Prince who had not yet received attention. Hundreds of families have been living in makeshift shelters the majority of which comprise of only four sticks and one cotton sheet – insufficient to keep a family of five or six out of the hot sun. 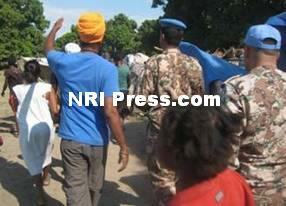 Upon seeing this, UNITED SIKHS volunteers quickly mobilized the necessary security forces for immediate assistance. Within days, over 500 families at Edzer Louis’ camp site at Lilavois 47 were delivered water, rice, beans, cornmeal, cooking oil, and even kitchen equipment to set up a local community kitchen. 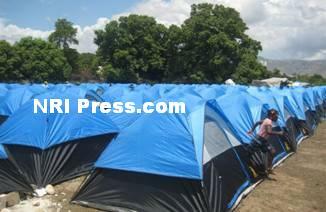 After further site preparation, these families also received over 500 tents. The displaced community can now work to rebuild their lives with a sense of order and dignity. 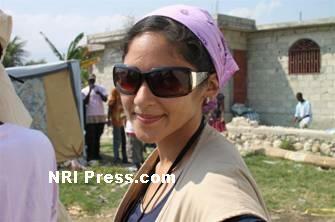 UNITED SIKHS volunteers worked tirelessly to organize and train community members in the rebuilding process. “We would like to thank the members of Light of the World, Life Church Missions and MDM Greece & Portugal for assisting our UNITED SIKHS team: Clint Davis, Natalie Landis, Sara Bove, and John Bopp. Thanks also to Shinai, a good friend whose invaluable assistance with translation aided our work tremendously,” said Jaipal Singh, UNITED SIKHS Coordinator for Urban Design & Development. Jaipal is an Architect by profession who specializes in Community Building and holds a Master in Urban Design. UNITED SIKHS volunteers, Kirpaul Singh and Charanpreet Singh, coordinated with IOM - the UN division distributing emergency materials in the form of tents, plastic tarps, and other supplies. 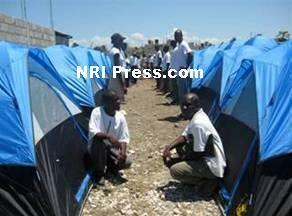 A total of 112 3-family military style tents and plastic tarps were provided to UNITED SIKHS volunteers, who distributed this to three different communities, allowing hundreds of Haitians immediate relief from the intense sun and future relief from the imminent rains. 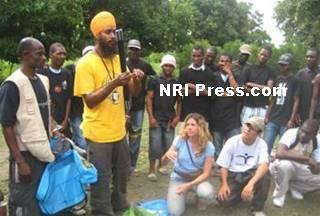 Charanpreet Singh actually extended his stay in Haiti and worked tirelessly to establish UNITED SIKHS relations with local organizers like Noel Nickelson. Dharam Singh is presently continuing this tireless effort of collaborating and solidifying relationships so even further impact can be had. “On behalf of my people, I thank you for the food and tents you have given to help my people. We are very grateful to God for all of your help.” said Noel Nickelson, a Local Haitian whose community has been receiving assistance from the UNITED SIKHS Langar Team since early February. Noel’s community lives in the Sarthe neighborhood, where many continue to wait assistance. “Shelter is something we all take for granted, but for the Haitians affected by the earthquake, the lack of shelter is a reality. Providing shelter to the women, children and families affected by the Haitian earthquake is something that we all must take part in. We are very proud that the members of Guru Nanak Sikh Gurdwara (Delta-Surrey) and the Sikh Community of British Columbia were able to assist the Haitians in their time of need." said Bikramjit Singh, President Guru Nanak Gurudwara, Surrey, Canada. "It was great to see UNITED SIKHS funding going directly to these people,” said UNITED SIKHS Volunteer, Ramita Kaur. “The things we were able to do, the people we were able to reach, the thanks that they gave in return. It was priceless. It's haunting to leave and know that there is so much left to do. What we did was just the beginning - the tip of it - little things that we could do to just help put band-aid solutions over the real problems. But there is so much more to do to get the real root of it. Still, when we finished putting up all the tents, the feeling of accomplishment was indescribable. When they were cheering, it gave me chills to hear that. They had nothing, yet they were giving us so much love in return." Ramita Kaur, a Sound and Vibration Engineer at Ford, helped in the construction of the tents with the Urban Design & Development Team. The spirit of our Haitian mission was summed up by Jaipal Singh as follows: “Our local staff - our dear friends - were a constant reminder of our mission, and challenged each one of us to carry the torch of Guru Nanak in Haiti. Sure, we provided a few supplies, and set up a few tents. That does not compare to the lifelong relationships we built, the love and respect we fostered, and the trust we forged between our Haitian brothers and sisters. Guru Sahib reminds us to ‘Recognize the Human Race as One.’ This mission was not about food, clothing or tents. It was about the spirit of humanity, the strength of the human character. It is hard to describe the experience in Haiti, but it has left a mark on each and every one of us."